Integrated circuits, and devices fabricated using the techniques developed for integrated circuits, have steadily gotten smaller, more complex, and more powerful. The rate of shrinking is astonishing - some components are now just a few dozen atoms wide. This book attempts to answer the questions, "What comes next?" and "How do we get there?" 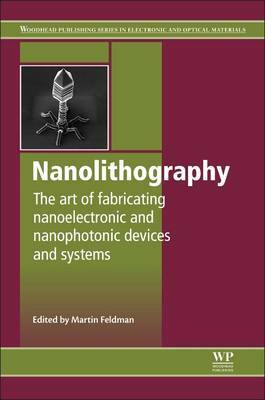 Nanolithography outlines the present state of the art in lithographic techniques, including optical projection in both deep and extreme ultraviolet, electron and ion beams, and imprinting. Special attention is paid to related issues, such as the resists used in lithography, the masks (or lack thereof), the metrology needed for nano-features, modeling, and the limitations caused by feature edge roughness. In addition emerging technologies are described, including the directed assembly of wafer features, nanostructures and devices, nano-photonics, and nano-fluidics. This book is intended as a guide to the researcher new to this field, reading related journals or facing the complexities of a technical conference. Its goal is to give enough background information to enable such a researcher to understand, and appreciate, new developments in nanolithography, and to go on to make advances of his/her own.